Design Thinking, User Experience, Creative Concept, Prototyping. Each step was thought out to the finest details until we reached a new product for the bank’s retail customers and corporate clients, offering useful ways to implement new technologies. 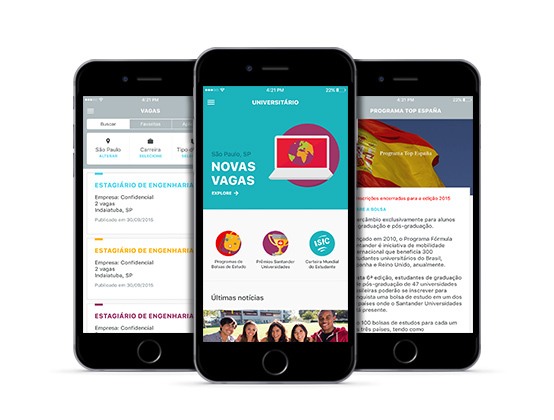 A project focused on usability and creativity produced a new concept for the mobile app geared toward university students – youth whom Santander believes will be its greatest customers in the future. More modern and intuitive, it was designed as a hub for information relevant to this audience: internship positions, budgeting advice, student ID cards. 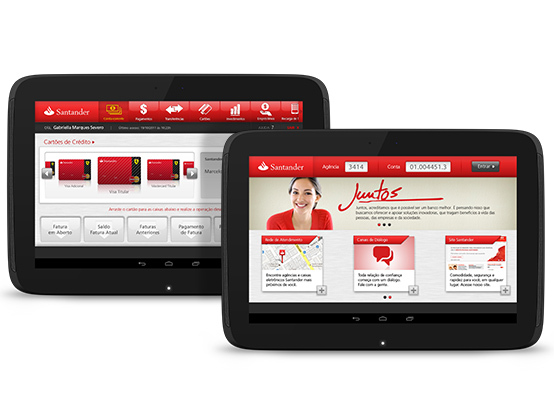 This 2010 project kicked off the bank’s mobile solutions. Mobility and utility combined in an app that required teamwork between our usability, design and technology teams. The app offered an ambitious (and new) experience for retail customers. Among many features focused on transactions and advice, we included a tool designed to categorize and control expenses using a simple and efficient UI; videos about investing; and geolocation-aware maps showing the bank’s branches. In addition, of course, to queries and transactions for their checking accounts and credit cards. The bank had more than five legacy systems for the branches’ customer service teams. 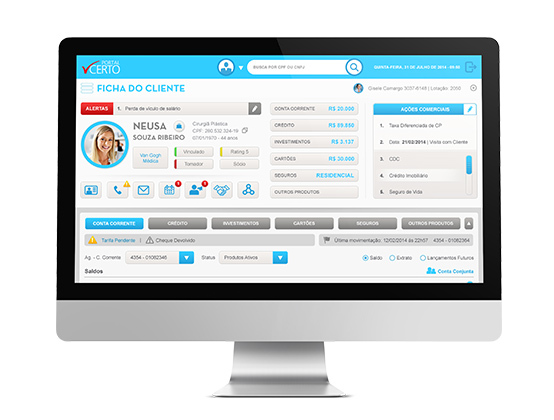 Portal Certo was our solution to the challenge of creating a single integrated system with excellent usability and design. The new system helped reduce operating time in branches and increase customer service quality. With simple, fast, pleasant and easy to navigate interface, we brought to one central location the main features managers use on a daily basis: weekly calendar, client registry, contact list, investments, prospecting, campaigns and more of the bank’s client and target management tools. The time savings led to more and better results – for every public and in every way. 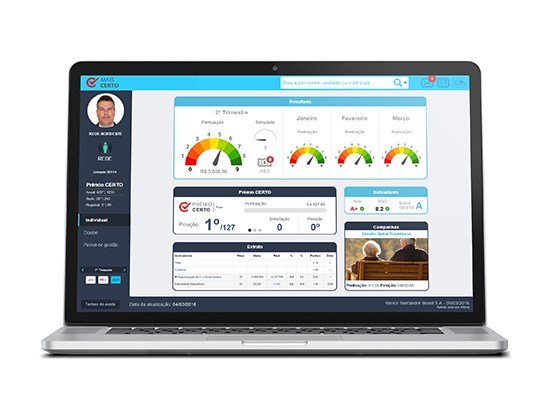 We developed a new interface for the Bank’s incentive programs with gamification concepts. 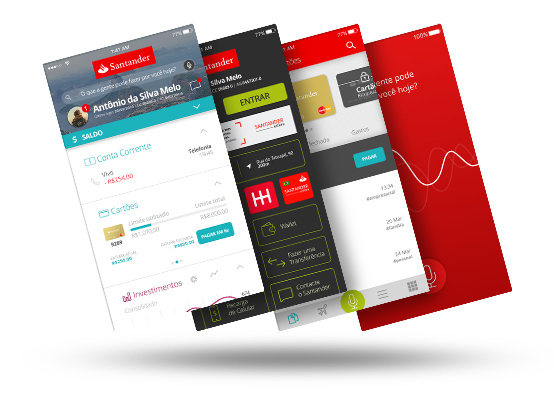 An interactive platform that was simple to use and included the campaigns, tools and rewards involved in Santander’s programs. We developed the usability, creation and code for a new internet banking platform, with a new concept involving widgets, customer segmentation, customized operations and more features.